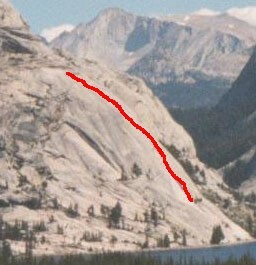 Great White Book is a very popular, moderate route up a classic huge dihedral on the most accessible dome in Tuolumne. Although “the angle is embarrassingly low,” it is an awkward, long chimney and offwidth system, on polished rock, with poor protection for long sections. Additionally, a huge friction traverse on the last pitch is unprotected and scary for the inexperienced. It also poses problems for the novice follower looking at a giant pendulum. For these reasons, even though it is “only 5.6,” many climbers will not have the experience to feel comfortable on this climb. Which SuperTopo guidebooks include a topo for Great White Book?